Looking back on forty three years of scholarly activity other than teaching, I see five distinct, but overlapping phases of primary interest . GeoArchaeology: Beginning in 1973, my early work on Arctic paleolithic archaeology, paleoecology, and paleoclimatology culminated with the 1982 founding of the Alaska Quaternary Center, and my chairing of the Geological Society of America’s Archaeological Geology Division. I continue to help advise Ph.D. students in UConn’s Department of Anthropology, where I have been jointly appointed since the late 1980s. My work on stone walls overlaps with historic archaeology. Glacial Tectonics: In 1976 I began working on the glacioisostatic flexure and crustal tilting of western Washington, and the paleo-seismicity of New England and Puget Sound. This work was put on hold for a decade, resumed with several grants from the U.S. Geological Survey’s National Earthquake Hazards Program in the mid 1990s, and is returning to my desktop for final publication. Anthropocene: My mid-career work on the origin and development of New England’s upland stone walls and lowland freshwater wetlands was part of a broader broader trend in geosciences that treats Homo sapiens as the dominant geologic agency on planet Earth. The wetland work featured the archetype small New England catchment of Susquetonscut Brook in Lebanon, CT.
Science Writing: In the mid-to-late 2000s, the bulk of my scholarly effort concerned science writing. From 2003-2018 I wrote regular opinion columns for the Hartford Courant the state’s flagship daily, every week until 2008 and biweekly after that. I was the Courant’s first opinion-writing scientist, and the only member of the Geological Society of America who wrote regularly for a metropolitan daily. I continue this work, with freelanced pieces in preparation and in press. Environmental History: Beginning in 2009, my career took an unexpected pivot toward environmental history, drifting from the geo-archaeology of stone walls to the hidden history of America’s kettle lakes, and then to the self-taught 19th century scientist Henry David Thoreau. My most recent scholarly book, The Boatman, is marketed by its publisher (Harvard Press) as Biography and American History. Recently, I’ve submitted two invited scholarly book reviews for the journal Environmental History, and have published two invited book chapters, one on Thoreau’s Physical Science, and another on the geoscience beneath his book The Maine Woods. What has not changed over the years is my mantra: “No rock. No ecosystem. No culture.” In translation, all of culture is supported by ecosystems, all of which depend on what Thoreau called the “living rock,” the solid earth. 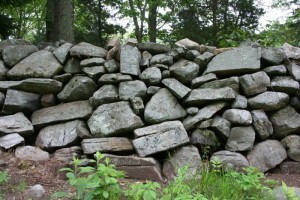 Photo: Historic stone wall in Guilford, CT dominated by locally derived gneiss. 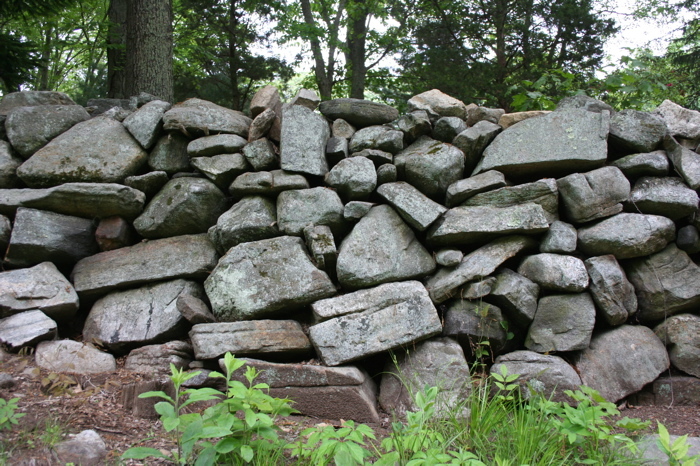 Stone size and arrangement suggests an early farm boundary, perhaps late 18th century.